The figures will complement WWI aircraft models nicely but are less suitable as stand-alone figures. 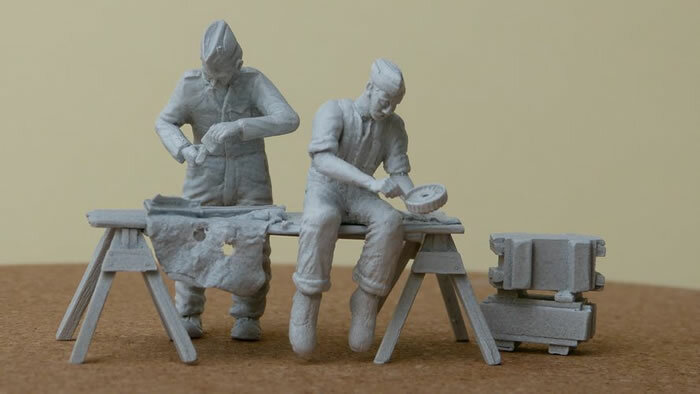 After producing a range of resin correction parts for aircraft kits in 1/32 and 1/48, Brian Fawcett is now offering a range of WWI air and ground figures. There are three sets in this initial release with more in development. The design philosophy is to keep the figures simple to paint and concentrating on realistic poses rather than very fine detail, so they are aimed at aeroplane modellers who are looking to add some human interest to their finished builds rather than figure modellers . 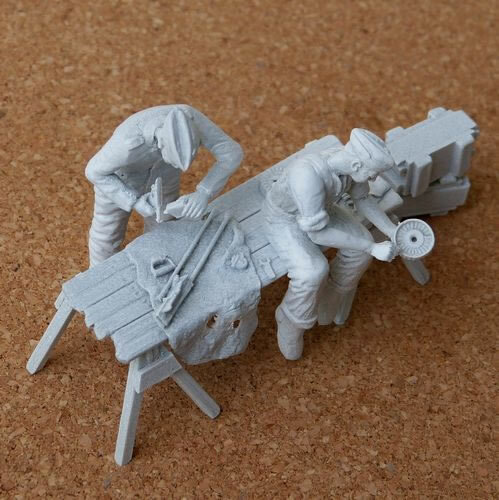 This set contains two armourers preparing the Lewis ready for use, a makeshift table and trestles and two ammunition boxes stacked. One figure has his jacket off and is loading a Lewis drum and the other is dressed in overalls and is oiling one of the breech pieces. The makeshift table (door laid on its side) has a nice representation of a well-used cloth, a broken down Lewis gun and scattered rounds. 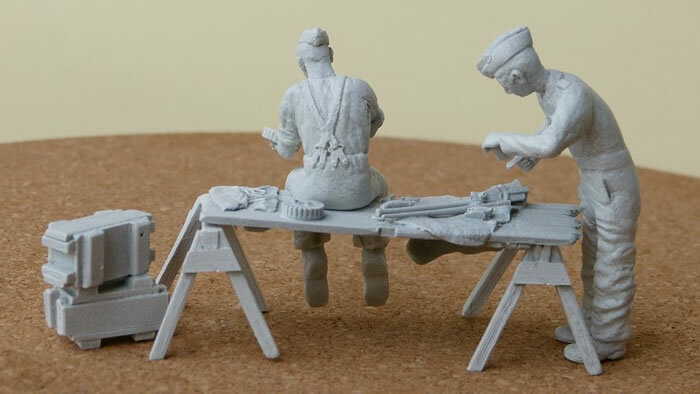 My first thought looking at the spanner on the makeshift table was that is rather too short and had been mis-moulded but after a bit of research I discovered it is an accurate representation of the Lewis Gun Spanner, a specialised tool. The Major is depicted as short and slightly portly – the designer having in mind the character "Captain Mainwaring" from the TV series "Dads Army". It is a one-piece figure dressed in a late RFC uniform, leaning on his walking stick. The Flight Sergeant is a one-piece figure dressed in the early "Maternity Jacket", a pre-war design that continued in service until it was declared obsolete at the formation of the RAF in 1918. The figure’s jacket lacks the shoulder straps of the 1914 model so would represent the 1912 model. The Other Ranks maternity jacket was produced in hard hairy serge with buttons made of horn. Rank badges appear on both sleeves. Pantaloons were cut loose in the thigh and tight at the knee. They were made from a fabric similar to whipcord but not as smooth, and fastened with laces at the knee. They were worn with drab puttees wound from the bottom in infantry style, and black ankle boots. The uniforms and equipment are accurately represented. The poses are reasonably natural, particularly the Lewis Gun vignette. 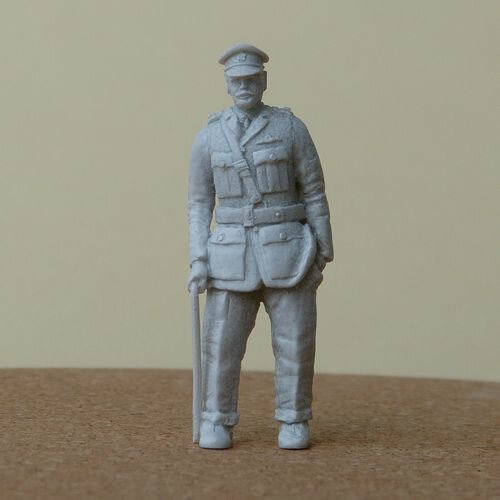 The Major and the Flight Sergeant are rather short (~48mm and 47mm respectively). I raised this with the designer and his response was that average height was lower at that time and that aircrew are typically on the shorter side of average. It would be useful for aircraft modellers who are new to figure painting to have more guidance as to colours and figure painting techniques, perhaps a colour photograph of a completed figure and/or more information on the website. The figures will complement aircraft models nicely. I particularly liked the vignette of the Lewis Gun armourers which is nicely executed. The Major and the Flight Sergeant figures are a bit short but this will not be particularly noticeable unless posed alongside figures from other manufacturers. 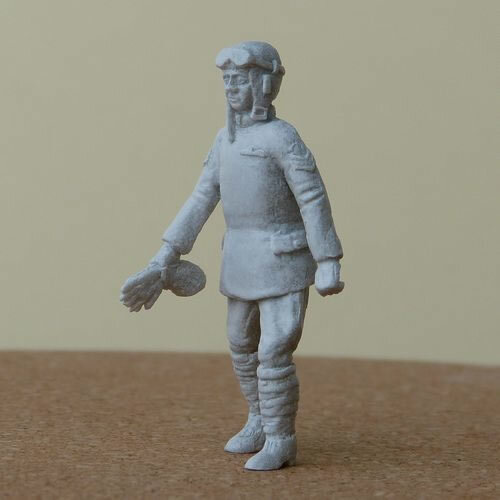 This is a worthy start to a promising range of WWI air and ground crew figures. Next to come is a couple of FE2B crew figures for putting in the WNW kit.